If you read any Young Adult novel this year, read this one. If you read any young adult novel this year, read this one. The Hate U Give has spent 30 weeks on the New York Times Bestseller List (most of that in the number one spot) and for good reason. This book is incredibly well done, is own voices, a diverse read, and probably the most important novel of 2017. 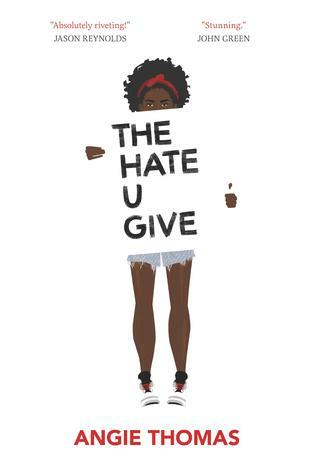 The Hate U Give is exactly what so many of us need. It gives people like me — white, middle-class, privileged-but-doesn’t-always-realize-it — a realistic and incredibly well-done literary experience of what people-of-colour face far too often in our world. It tackles intense, polarizing issues like Black Lives Matter, police shootings, teen crime, and poverty in one of the wealthiest countries in the world. I screamed. I swore. I ugly-cried. And, I learned a lot about privilege. Starr is a fantastic teen. So is Khalil. They are normal teens, doing normal teen things. They are teens who love their families. Teens who have goals and dreams. And yet, they are dealt crappy cards. Cards dealt by institutionalized, socially-ingrained, internalized racism. Starr’s two worlds collide when Khalil is shot. And the things she and her friends and family realize are heartbreaking. Reading this novel was like entering another world for me. I grew up in a small city and in communities with big backyards, manicured lawns, and mostly other white people. It wasn’t until high school that there was a black or brown person in one of my classes. My family wasn’t rich growing up but we had enough, and when things were tight, my parents didn’t let on to us kids. As a woman, I’ve been afraid of walking through a dark parking lot, I’ve been concerned by the man walking behind me who seems to be following me, but I’ve never felt like I needed to fear the police. I’ve never felt like my skin colour made me a target of prejudice in my own city. Reading Starr’s story, Khalil’s story, opened my eyes, once again, to just how much privilege I have every day, simply because I have white skin. A hard-hitting discussion of a pressing issue. Angie Thomas doesn’t just tell Starr’s story. She also tells Khalil’s. And in doing so, she tells the story of so many black teens who have lost their lives to police — not necessarily because of any crimes or violence they were committing at the time of the shooting, but because the police officer feared for their life. The Hate U Give discusses the reasons why those officers may have fired their guns at those teenagers, and why whatever crimes those teens may or may not have previously committed (things like selling drugs, being in gangs, vandalism, robbery) does not validate why they were shot dead while they were unarmed and not in the act of committing a crime. The novel also delves in to the why these teens may have been involved in criminal activity and the importance of looking at the whole person, including their family circumstances and their past struggles and hurts. I can’t get over how good this book is. I know this review cannot do it justice. I only hope that I’ve convinced you to, if you hadn’t already decided to, read this book as soon as you can get your hands on it. It’s not an easy read. It’s painful. It will make you angry. But it is fundamentally about the love that binds families and friends together, and the horrible injustices happening to so many families in our world today.